Gary Nash of Eat or Heat Foodbank. Saira Mir and family of PL84U AL-SUFFA. Established in 2012, PL84U-AL SUFFA is a charity providing hot meals, a friendly environment and gateway to local services for those living in social, economic and cultural deprivation and isolation including the elderly and homeless. Assisted by volunteers and local businesses, PL84U AL-SUFFA welcomes people of all faiths and none and helps builds community cohesion. HSCB (Hoe Street Central Bank) has been printing its own money in the former Co-Op Bank on Hoe Street in the London suburb of Walthamstow. Between 12th - 25th March 2018 a crack team of locally recruited people of all ages and backgrounds worked with artist Hilary Powell to print banknotes of 1, 5, 10, 20 and 50 in just fourteen days. Between 5th-23rd June 2018 we focused on a special edition of big money - making ltd edition 100 and 1000 notes from obsolete Bank of England notes. In place of the Queen, leaders of the local foodbank, homeless kitchen, youth project and primary school grace HSCB banknotes. B) Contribute to a debt abolition fund in which 1 million pounds worth of local predatory payday debt is bought up, written off and symbolically destroyed. The banknotes - denominations 1,5,10,20 and 50 are NO LONGER FOR SALE. 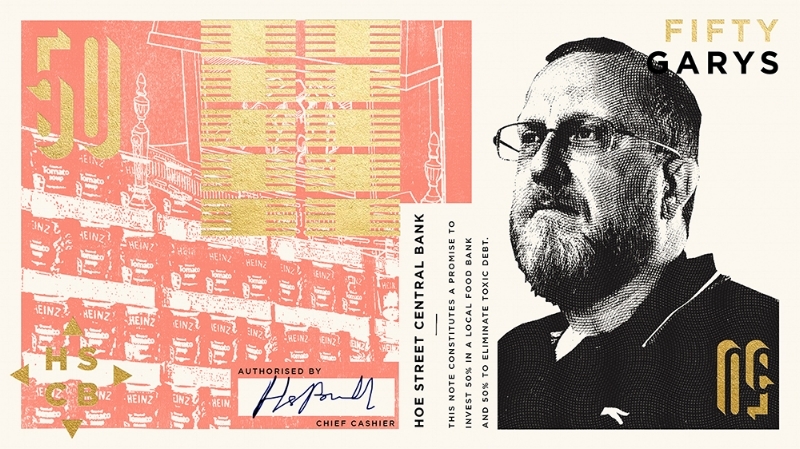 Very limited remaining special edition 100 and 1000 notes are available on request with proceeds going to keeping this project going now we have enough to share equally between the purchase of £1 million of local debt and the four local causes. NOW IT IS TIME TO BUY BONDS AND MAKE THE PUBLIC EXPLOSION OF DEBT AS A DRAMATIC ACT OF ECONOMIC LIBERATION HAPPEN. The Soul Project is a Youth Space that engages young people, between the ages of 8 – 14 years old, in positive activities that contribute to the growth of the community. It is currently being forced out of its building and seeking new ways of being able to provide a setting for young people to hang out and a variety of workshops and activities including games, dance, sport art and music. Through its programme, it aims to keep young people on the right track and inspire positive direction within the community. Tracey Griffiths. Head Teacher of Barn Croft Primary School. Barn Croft Primary School is a small, one form entry primary school in Waltham Forest. The school encourages pupils, parents and staff to work together to secure the best possible future for the children that attend, regardless of economic, social or cultural backgrounds. 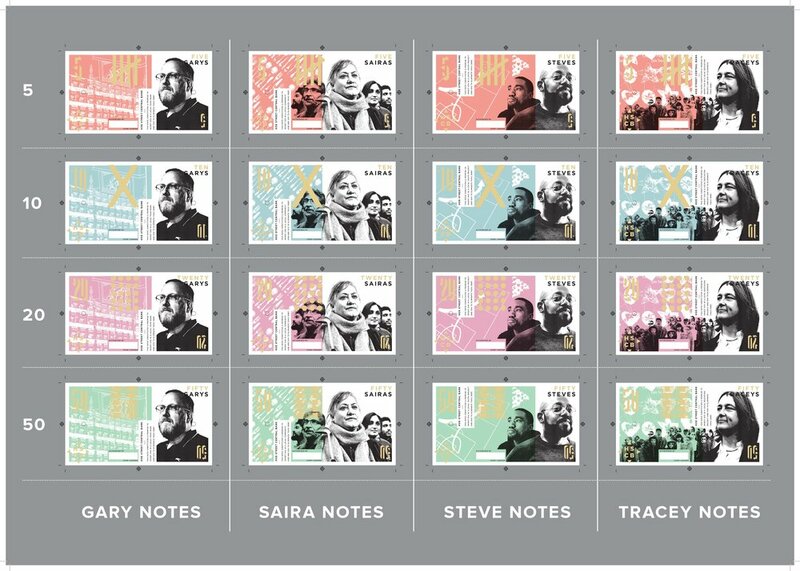 These are digital representations of the final printed notes. The colour range is the same but colours differ from the screen and the gold is foil blocked and shiny. They are all individually screen printed, letterpressed and foilblocked with additional finishing, stamping and signature.